Wild Witches Video Slot Guide & Review - Casino Answers! Wild Witches is a 5-reel, 20-line video slot developed by Net Entertainment, featuring two wild symbols, scatter wins, multipliers and a free spins feature. You can play the Wild Witches video slot at Bovada. Coin values on the Wild Witches slot machine are $0.01, $0.05, $0.10, $0.25, $0.50, $1 and $2. You can select 1-20 paylines at 1-4 coins (or “Bet Levels”) per line. The lowest total bet you can make on the Wild Witches slot game is a penny per spin up to the highest total bet of $160 per spin. Wild Witches has a very wide betting range that should be appropriate for high rollers and for casual players as well. Players can manually skill stop the reels on the Wild Witches online slot by hitting the Spin button a second time during a spin. 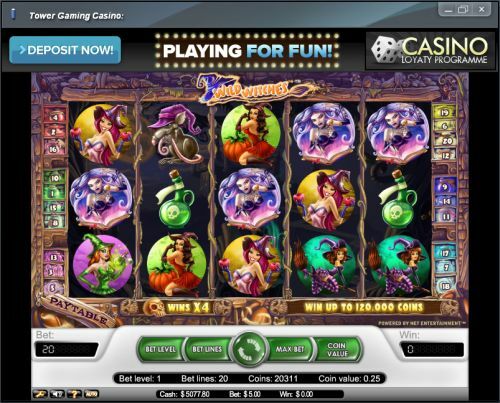 To play Wild Witches, select your bet and hit the Spin button in the center of the game buttons. To play the maximum bet on your coin value, simply hit the “Max Bet” button. The highest paying symbol on the Wild Witches video slot is the Spellbook Wild symbol. If you 5 Spellbook wild symbols land on a selected payline, you will win the 10,000 coin top jackpot. The wild symbol substitutes for all symbols except for scatter symbols. Wild wins are doubled when substituting for otehr symbols. The Witchy Wild symbol appears on the third reel only. It acts as the same way as the regular wild, except wins pay 4X when substituting other regular symbols. Wild Witches’ scatter symbol is the Cauldron. 2, 3, 4 or 5 Scattered Cauldron symbols anywhere on the reels of Wild Witches will pay out 2X, 5X, 25X or 500X your total bet. Also, 3, 4 or 5 Cauldron symbols will win you 10, 20 or 30 free spins with a 3X multiplier (excluding additional free spins). With your winnings tripled, you can win a lot of cash from Wild Witches when you play at Bovada! By hitting the “Auto” button, you can play 10, 25, 50, 75, 100, 250, 500, 750 or 1000 autoplay spins on the Wild Witches slot game. You can also set advanced settings by hitting the “Advanced” button. You will be able to stop the autoplay on any win, if you trigger the free spins feature, if a single win exceeds (any amount you input) or if cash increases/decreases by (any amount you input). You can stop autoplay on the Wild Witches video slot at any time. If you like witches, you’ll love the Wild Witches slot. Net Ent has done a great job putting it together and it has enough special features and juicy payouts to keep your interest. To play Wild Witches for real money, you can sign up and make a deposit at Bovada! 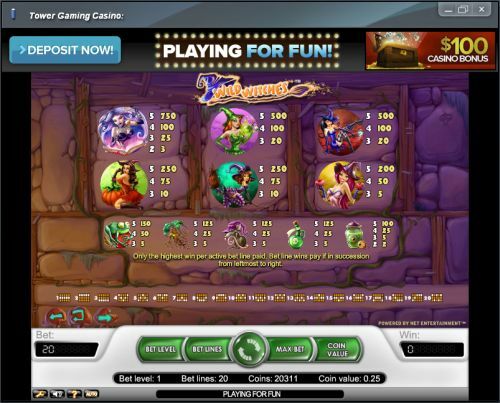 Can I play a free Flash game of the Wild Witches online slot game? Yes, you can play a Flash version of Wild Witches for free or real money over at Bovada. If you experience problems with their Flash software, make sure you have the newest version of Adobe Flash Player installed on your computer. Can USA players play the Wild Witches video slot for real money? While Americans can’t play Wild Witches for real money, they can read our Mystic Slots CTXM Review or play it at Bovada Casino. For more Halloween slot reviews involving everything from vampires, ghouls, ghosts, monsters and more, please read our list of Halloween slots. If I have a Macintosh, can I play the Wild Witches video slot? Yes, if you are on a Mac, you can either play at an Instant Play casino or you can download the Tower Casino software. For more on Tower Casino, please read our Tower Casino Review.